Every year IBM predicts the future of technology naming 5 technological innovations that seem science fiction today but are thought to be commonplace in 5 years. The selection of the 5 in 5 is based on technological availability in the IBM labs and extrapolating societal trends. Here are the 5 technologies that IBM expects to be part of our daily lives by 2017. 1. People-generated power will be collected and contribute to charging our electronic devices. Anything that moves has the potential to become a power source. Footsteps or the cycling of a bicycle wheel releases energy that is now wasted. IBM predicts that small devices installed in your shoes or on your bicycle will be able to collect this kinetic energy and convert it into electricity. 2. The man machine-interfaces will emancipate further from the keyboard. Communicating with devices went from keyboard to mouse to touch screens to voice recognition. By 2017 bodily intermediaries will be taken out of the equation and devices will be controlled directly by brainwaves. The first consumer application is already on the market. For $299,- you can order the Emotiv EPOC neuroheadset which reads electrical brain impulses. It allows you to move virtual objects on a monitor with your mind. 3. Mobile devices will close the digital divide. In a world where knowledge is power the gap between those who are connected to the online repository of human knowledge and those who are not is ever widening. Mobile devices are increasingly enabling people without a landline access point to connect to the net. IBM predicts that by 2017 80% of the world population will have a mobile device. 4. Junkmail will become a thing of the past. Lots of information that is useless to you is pushed your way anyway. Because the sender doesn’t know who is actually interested in the information it’s just broadcasted to everybody. Not just the spam in your mailbox but also, say, that inaudible voice at train stations announcing which trains are delayed. In the new era of Big Data different data sets are matched to predict relevance for a particular person. For a commuter who takes the same train every day there is a high probability he will only be interested in the altered departure time of that particular train. By filtering out irrelevant data the amount of noise in the information flow can be reduced. 5. Passwords will become obsolete as biometric data such as voice files, retinal scans and facial definitions and even DNA replace the password system. The ubiquitous camera’s, microphones and touch screens will be employed to identify rightful owners securing devices and accounts against illegitimate use. One can only hope that the problem of securing the trail of biometric data we’ll leave behind, too is solved by 2017. 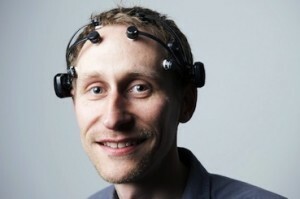 Photo: Kevin Brown of IBM Software Group's Emerging Technologies wearing the EPOC headset.